Many today know Samsonite as a leader in the luggage industry. Sleek looking designs that are functional and user friendly have won Samsonite a champion reputation. But you may be surprised to know Samsonite’s history goes far back into the glory days of American travel. I’m talking authentic vintage! And because Samsonite luggage is such great quality many chic vintage pieces have been preserved up till now. Adding a classy Samsonite vintage luggage piece to your collection is a sure way to stand out among the crowd. Vintage need not be limited to clothing, but can be authenticated by some ultra smart accessories by way of luggage. Vintage isn’t an easy score online. So to help you out. 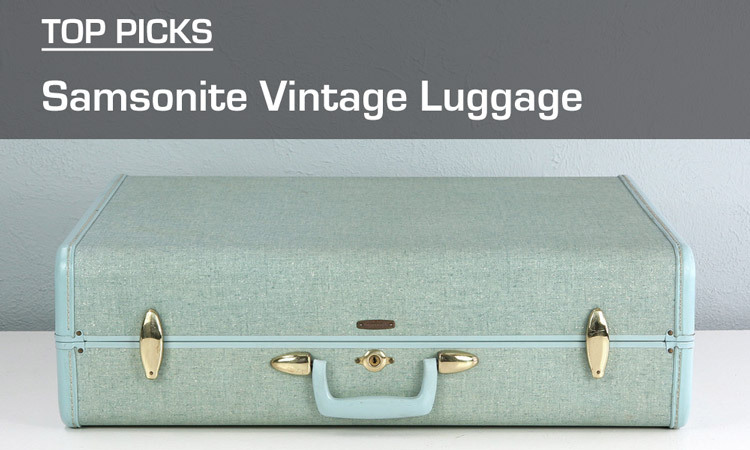 Here is a top 10 list of Samsonite vintage luggage. Also check out the previous article on our Top 10 Samsonite Vintage Carry-On Luggage. 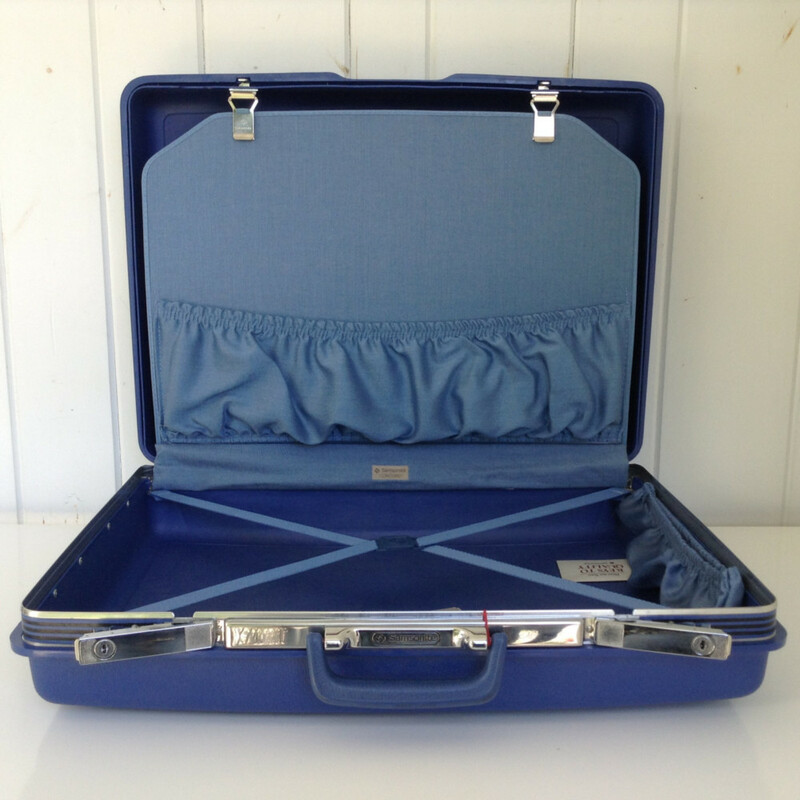 This blue vintage Samsonite Concord Survivor is a hard case suitcase, with it’s original tags and brochure. The color is a lovely shade of blue satin. Two handy elastic pocket hold smaller items securely. Metal trim and hinges are in working condition. Carry it around with a soft rubber handle. 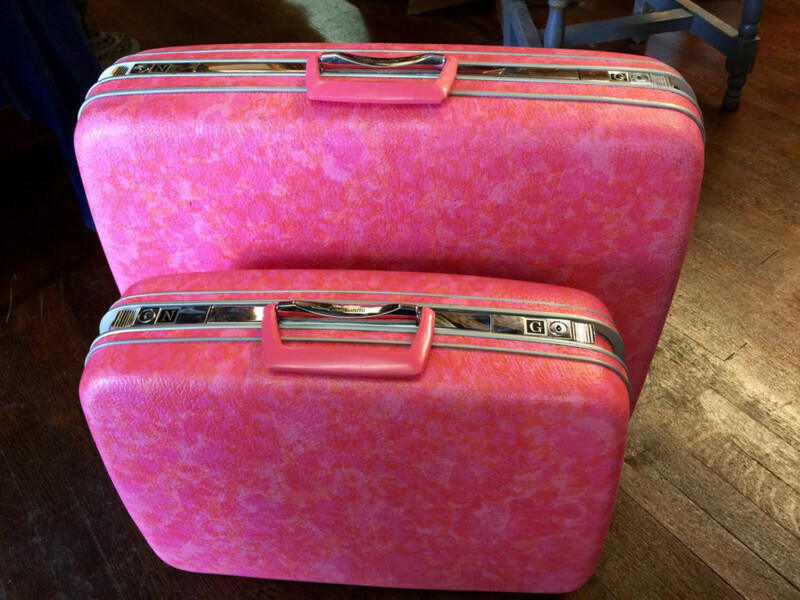 1950’s Vintage Samsonite Pink Marble Luggage. A marble finish and texture exterior give it a very unique look. Both cases are in good vintage condition. The interior is lined with a pink polka dot material. Small pockets for accessories are contained inside the cases. 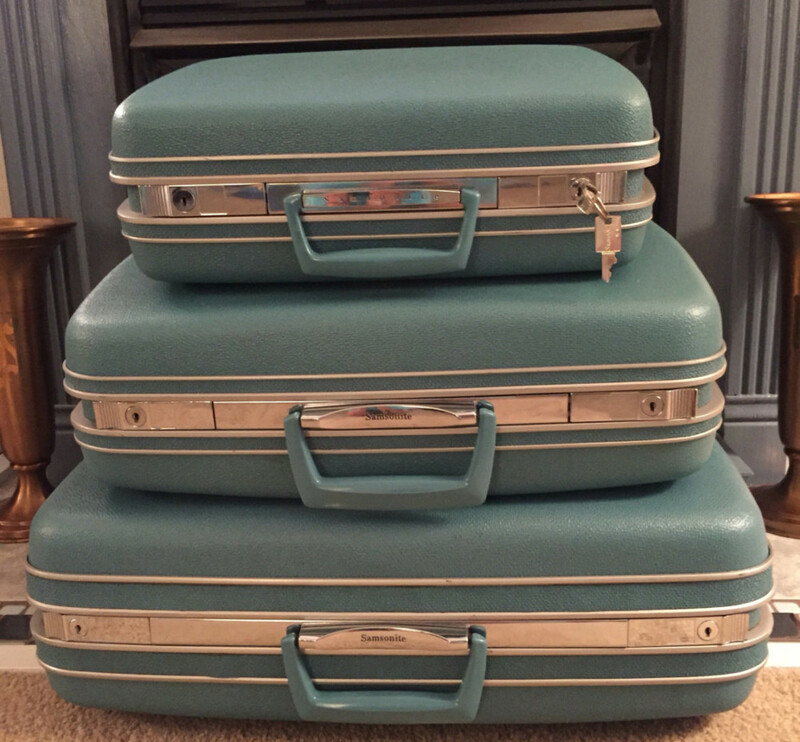 This chic set of three Vintage Samsonite Silhouette hard side luggage is a pale blue with a touch of green. The outside of each piece has little to no wear. Additionally the insides are also in beautiful shape. The set includes 2 keys that work on all three pieces. Each of the 3 pieces has accessory pockets and elastic pieces for holding various items in place. 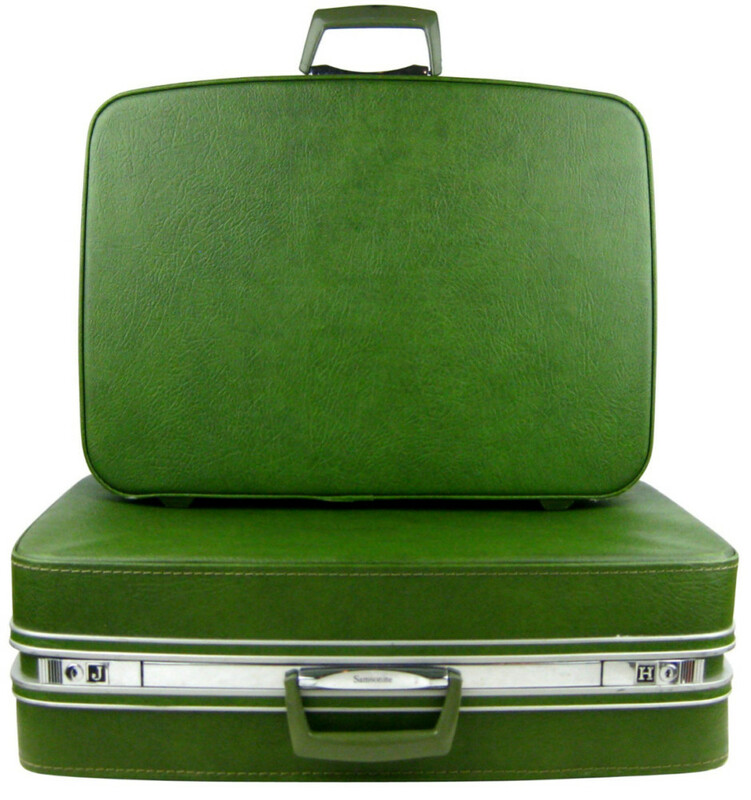 This Samsonite suitcase is one of my favorite vintage sets yet! I love the mossy avocado green color. The smaller case conveniently nests inside each other for easy storage. It’s equipped with chrome finishes on the latches, hinges, and metal hardware. The stitching is off white and the handle is chrome and green. The interior is lined with a stylish contrasting light mint polka dotted material. Straps and side zipper pouches in bottom sections make for good organization. Groovy baby… This set of mustard yellow Samsonite suitcases are “far out”. 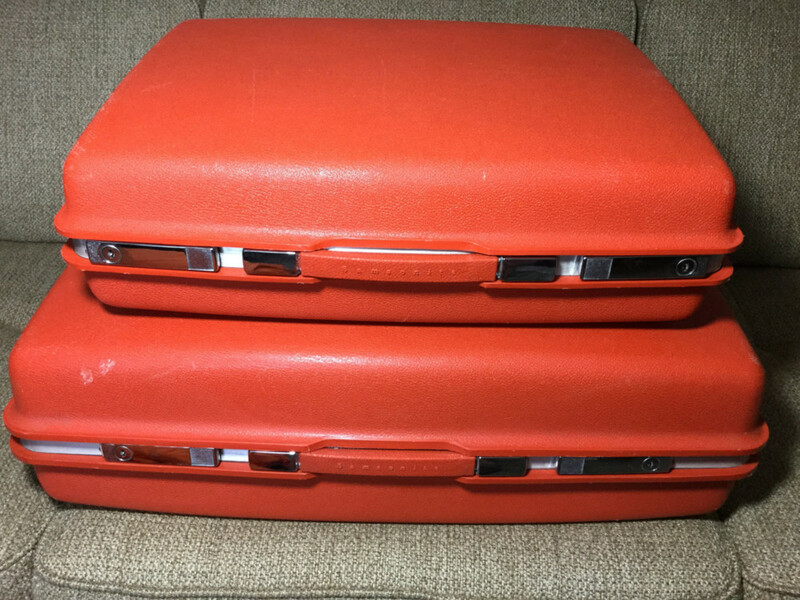 This is a fabulous set of two hard shell Samsonite Silhouette travel bags from the 1970s. They are lined with yellow polka dot lining in the interior. They have chrome metal hardware and plastic yellow handles. 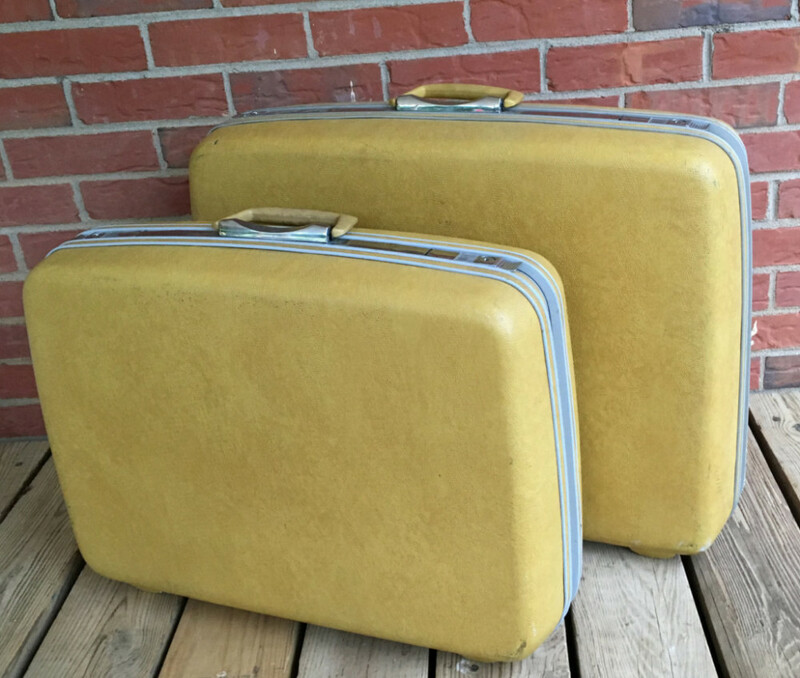 Also from the 1970’s, this pair of Samsonite suitcases is the first generation of the “Saturn” model. They are simple yet beautiful in vintage design. The ever rare burnt orange color is sure to stand out. The pair are exactly the same in their features. The smaller bag fits inside the larger for easy storage. 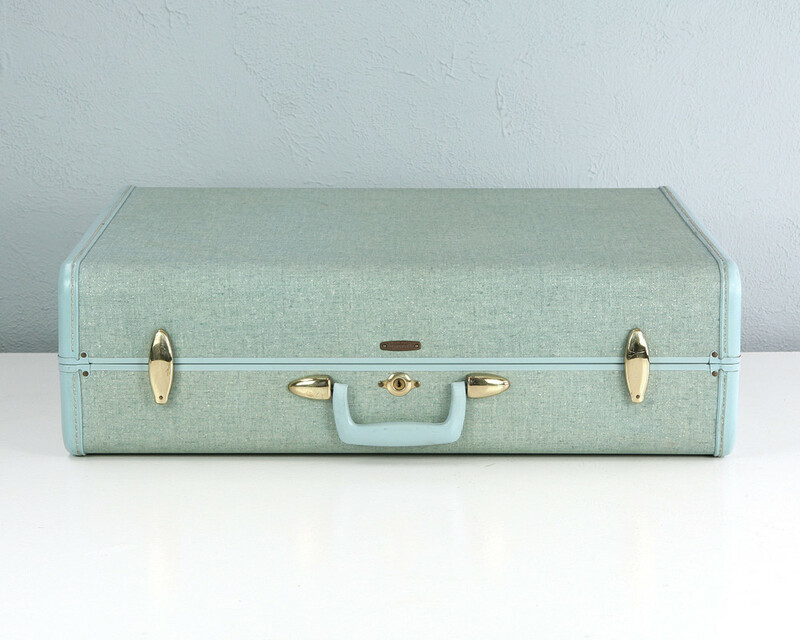 Step into the flirty 50’s with this gorgeous, tweed vintage Samsonite suitcase. I’m in love with the simple design and timeless light blue color. This leather vintage Samsonite luggage from the 1940’s will spark in any classic movie lover nostalgic scenes from the 1940’s Casablanca. This set is a dark rust color. The interior fabrics are either green, mauve or tan. 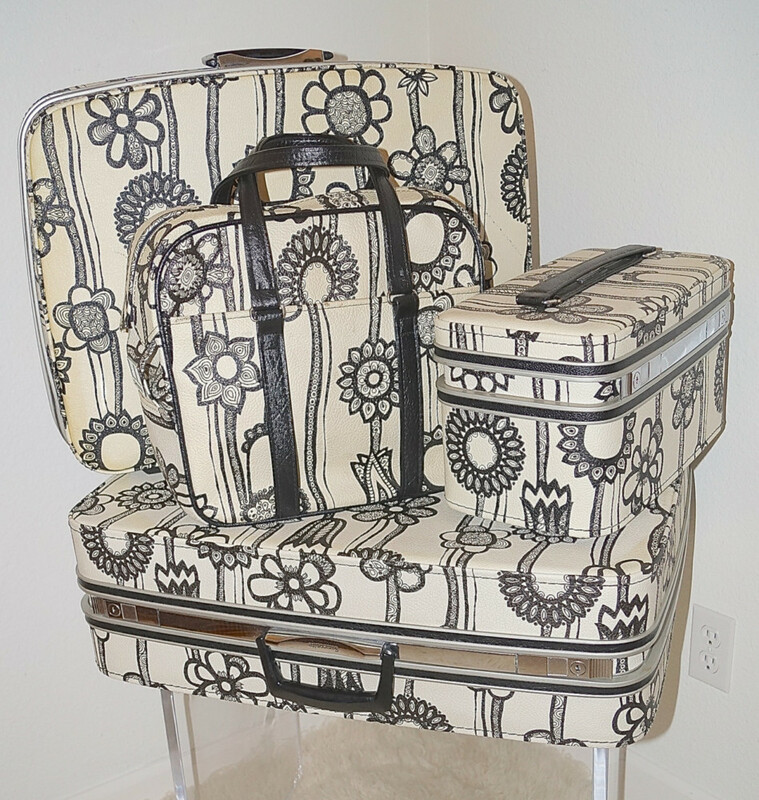 Vintage 1960s original vintage Samsonite Fashionaire (Marimekko style) mod black and white floral suitcases. 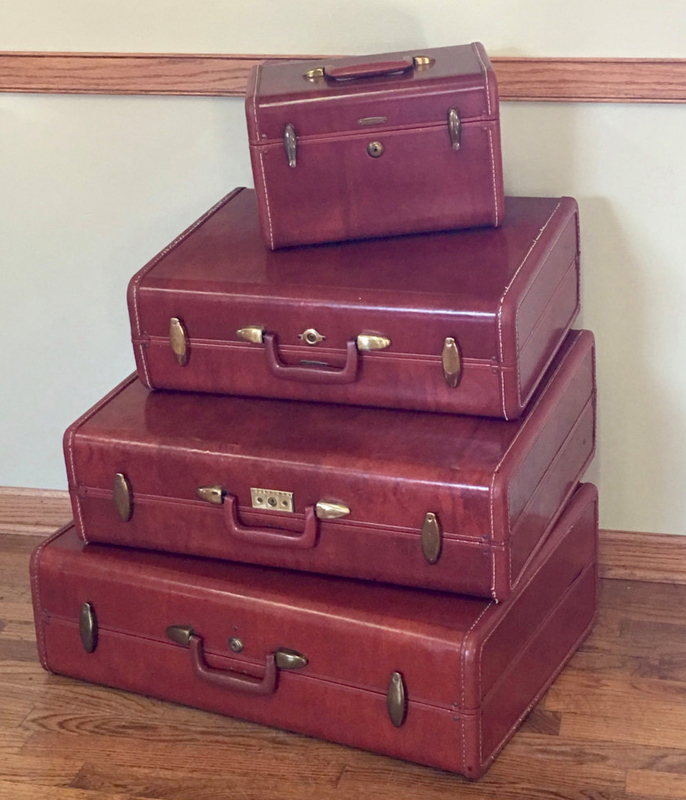 This is a set of 5 suitcases for traveling in vintage style! This set includes a large size suitcase, medium size suitcase, train case, carry on tote bag and small makeup pouch with snaps that holds small essentials and can either be carried as a clutch or snapped inside the tote. The tote has a zippered front compartment on one side, open compartment on one side and closes by zipper on the top. The train case is amazing with its original plastic tray and mirror.